I was thinking the other day about planning streets. About how the default is to plan for cars first and for other users after. 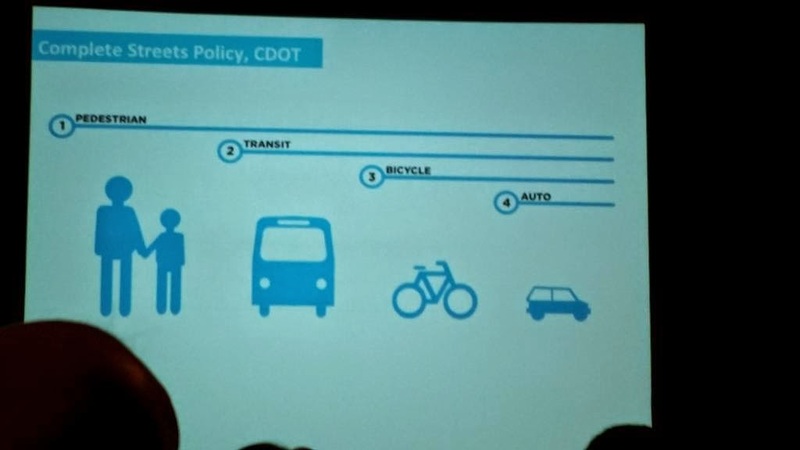 And about how it should work, which is that we should decide what our priorities are for each area (some areas might have transit prioritized over bicycles, some might have bicyclists prioritized over transit) and then plan based on those assumptions. For instance, if cars are not prioritized, planning shouldn't be subjected to a level of service analysis, because vehicular delays should not affect design. Pedestrians come first. Everyone (well, nearly everyone) is a Pedestrian (on Comm Ave) as they access stores, shops and buildings. Design for their mobility and safety first. Transit comes next. Take the B Line, add the 57 bus and the BU shuttles and you have 40,000 users using only a fraction of the streetscape. Keep them moving, keep them safe. Then bicyclists. Bicycles don't use much space, but the space they do use is used efficiently for a relatively high speed of travel. Plus it's healthy and emission free. Keep them safe and moving. Okay, we've come to cars. Is there enough room for cars? If the answer is yes, but it doesn't meet some arbitrary delay guideline (level of service), too bad. We've accommodated everyone else. We can't close the road to cars completely, but if they lose a lane of travel, it's not the end of the world. If we lose a couple of drivers from Framingham, so be it. So, kudos to Chicago for getting it right. And hopefully, Boston won't get it wrong. If MassDOT is trying to spread the pain evenly, they ought to put their money where their mouth is. As I point out in a subsequent blog post, giving even treatment to vehicles would result in a lot less room for them. The planning for Comm Ave, at least, puts vehicles first, and once they are accommodated (11 foot lanes, ample parking, long turn lanes) shoehorns in transit, bicycling and pedestrian facilities for the remaining 70% of the road users.